The Nerdy Teacher: Why is the Department of Education Terrible at Social Media? 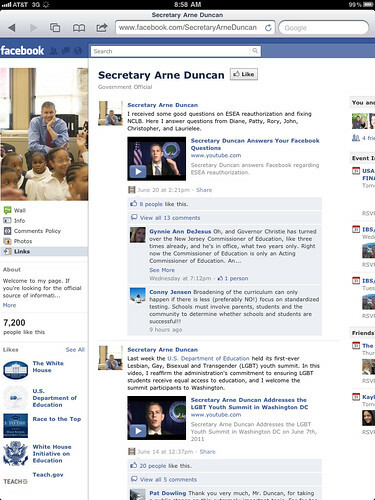 Why is the Department of Education Terrible at Social Media? I want to note that this is not a post about policy. There are many things many of us take issue with regarding current and past policies made by the administration, but this post is not about that. I want to discuss the Department of Education's social media presence. For this piece, I chose 3 key areas of SM and wanted to see how the Department of Education used them. I chose Twitter, Facebook and YouTube. I love YouTube. I plan on using it more next year to place screencasts and other goodies for students, parents and teachers. I've used it to create viral videos for ProjectPLN in the past and for uploading projects for my grad classes. It is very versatile as a medium. Sharing information quickly across the country is a huge benefit of YouTube. It allows the user to "speak" directly to the masses. President Obama does an excellent job of utilizing the power of YouTube. 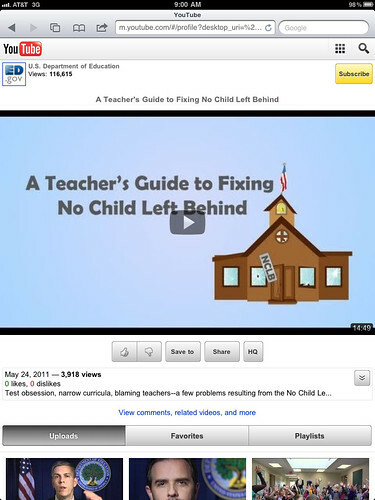 Why is the Department of Education terrible at YouTube? Notice in the top right corner the number of page views they have. 116,615 views. Let's assume they have been active since the Administration took over. That is an awful number. Their biggest video seems to be the one featured in the picture above. Over 3,000 views for a very hot topic. Still, that's only a little over 3,000. Such an issue should have tens of thousands of views with a crazy number of comments. Videos of cats playing with string have more views and comments than this. Where is the disconnect? There are some videos of State Teachers of the Year. That's cool. I feel that I'm pretty connected to the web and follow all of the Department of Education sites, but I have never seen a tweet about any of this. I saw tons of posts, stories and videos on the raid of that man's home supposedly put in motion by the Department of Education, but I don't see much from them. If they have an agenda that is not very popular (they do), then they need to use sites like YouTube to reach out and explain what they are thinking and why they are thinking it. Allowing people to see and hear what you have to say about various issues is a benefit of YouTube. Users could then create videos of their own and share them with the Department of Education. Examples of innovative lessons could be shared using YouTube. There is so much they could be doing, but they have very little. They are missing a golden opportunity to reach a vast audience interested in education. Until the Department gets their act together, most people will watch Charlie get his finger bitten again. Teachers are all over Facebook. It is a great way to connect with my friends in a format longer than 140 Characters. Business do a great job of creating pages for people to view and see their latest products. Celebrities have created fan pages that allow people to see what they are doing and keep abreast of the latest news. Facebook allows anyone and everyone to be connected and share ideas. It's a wonderful tool for educators. 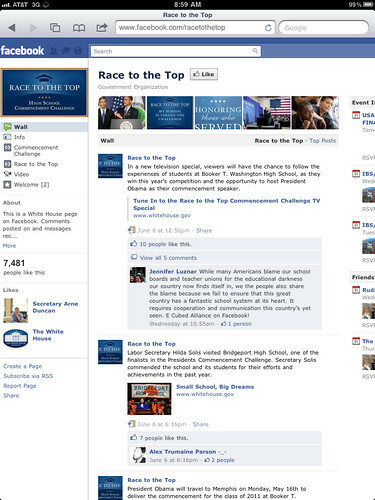 Why is the Department of Education terrible at Facebook? Wow, 3,648 likes. Well done. They are so close to surpassing Gaga. 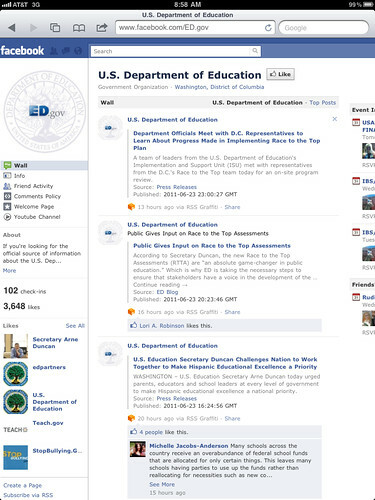 The Department of Education links their blog to their Facebook page and that seems to be it. Very little engagement with users of any kind. Some people will like a post and may even comment, but most do not. In age where people are spending hours a day on Facebook, the Department of Education is dropping the ball here. Facebook gives them a chance to reach, parents, students and educators in a place they are already connected. Sending out blog updates is almost as annoying as getting updates on people virtual farms. Teachers are expected to engage students in the classroom with dynamic lessons, yet the Department of Education uploads blog post after blog post. Another 3,000 plus outing for two very important pages. We see more engagement from users on these pages, but the comments are not very supportive. Why is the number so low? There has to be more than 3,000 people that agree or disagree with the current policies of the Administration. It would almost seem that the Department of Education is afraid to directly engage educators. President Obama promised more openness in government. He said technology is the wave of the future and we need to better prepare our students. How can this be expected of educators across the country when the Department of Education seems confused on how to effectively use the technology themselves? Maybe Twitter is an area the Department of Education excels. I love Twitter. It has made me a better teacher. It has challenged my thinking and tell everyone I know that they need to sign up. 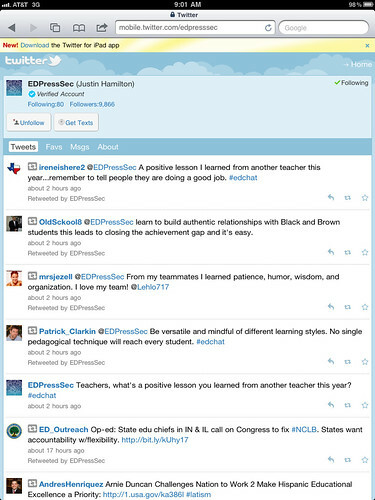 Twitter has become a space where educators have gathered to share their thoughts on all things education. Daily chats have been set up, by educators, to discuss content specific ideas in education. This has been a grassroots effort by passionate educators to make positive changes in education around the world. Where are the arms of the Department of Education in all of this? Those are crickets you are hearing. Many efforts have been made by many educators to get the Department of Education involved in various Twitter chats, but nothing has come of it. So, why is the Department of Education terrible at Twitter? 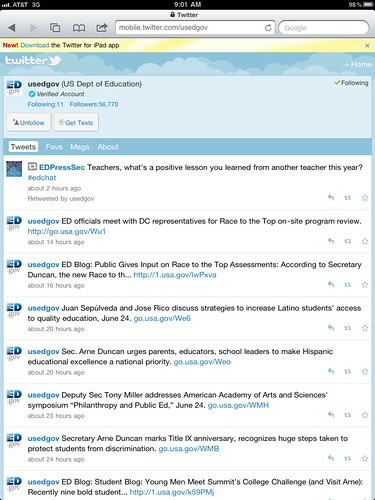 This is the main Twitter account for the Department of Education. They are pretty good at sending out education related information, but it mostly about what they are doing. I'm ok with that. The department is large and they are trying to reach out to as many people as they can. I have found some useful links from time to time, but they do not engage educators as much as I would like to see. Here is a good account that should be used to participate in the various chats. I'm not sure how they structure the Department of Education, but I would like to think that they have departments or people in charge of the various content areas in education. A person/department for Science Education, Math Education, English Education, Special Education, etc. If this is the case, they should be jumping in the various Twitter chats to see what people are saying. This is how the Department could really gain insight as to what teachers are doing and thinking about. If they do not have people dedicated to these areas, how do they divide the work? This is the account for the Press Secretary. This guys has been working hard and takes a ton of heat. We need to remember not to shoot the messenger. He is paid to pass along information that his bosses tell him to pass along. His job is not to engage educators. When he does, it ends badly. Screaming at the Press Secretary of the Department of Education on Twitter is not going to accomplish anything. He does not follow many educators because his job is to pass on information to news outlets. I think that it is a good idea to have someone from the Department of Education to engage educators on various topics, but the Press Secretary should not be the one that does it. They need to focus on other issues. Secretary Duncan has a Twitter account! It took a couple of years, but he is tweeting. He is not tweeting with any regularity and he only follows 34 people. This bothers me. He is the Secretary of Education. He is the "leader" of all things education related in this country and he only follows 34 people? My 1 month old follows more people than that. How can he "hear" anyone if he is not listening? Duncan has had an uphill battle since he took over the post. He is not a teacher. That is something that many teachers have a hard time accepting. To overcome this issue, he should be reaching out to educators across the country as much as possible. Twitter, along with other social media tools, allow him to hear from all walks of life. Most people just want to be heard, but the current system employed by the Department of Education is failing to do this. Secretary Duncan needs to find the right places and times to engage educators in meaningful discussion. Secretary Duncan has been invited to participate in #edchat, but it hasn't happened yet. I will chalk it up to scheduling issues. Secretary Duncan has a chance to engage educators in a forum that will allow him to speak directly to passionate and engaged educators. There is a large group of educators out there that want to be engaged and want to understand why things are the way they are. When a politician, any politician, is hesitant to engage a constituency, people assume they are afraid and have something to hide. This is the reputation the current Secretary of Education is building for himself. I personally do not think he has something to hide, but I do feel like he is avoiding confrontation. I do not always like what other people have to say on various topics, but I always give them a chance to speak up because there might be a chance I will learn something else. Education is one of those areas where everyone has to listen to all of the different ideas because we are all about ideas. 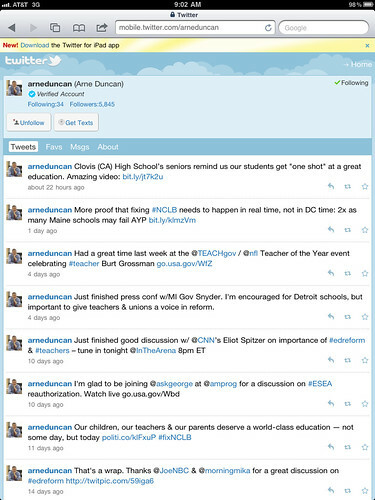 Secretary Duncan needs to engage educators on Social Media and Twitter provides the best opportunity to do so in real time. One basic fact of education is that there is not cookie-cutter solution to what ails us. Every district and even school within a district has various issues they are dealing with every day. Social Media could allow Secretary Duncan, and the entire Department of Education, a chance to hear from these educators, parents and students. The failure of the Department of Education to effectively use Social Media is a huge issue that should be addressed. I have no idea who runs the social media aspect of the Department of Education. At times, I feel there are too many cooks in the kitchen with different menus in mind. The only way the Department of Education can start to get people on board to support their ideas, is to effectively communicate their ideas to the populace. The Department of Education needs to sit down with someone and develop a plan for Social Media. Instead of going head to head with Diane Ravitch, (a battle they are losing) look at connecting with her and use Social Media to promote healthy conversations, not media based sniping. A solid plan of attack can help create a dialogue in which everyone learns and everyone wins. Hiring a Social Media consultant, preferably someone who has or does work in education would be a smart move to changing their Social Media reputation. My one hope is that this post will be read by people at the Department of Education and take the advice to heart. This post is really an effort to help you make a positive change in the way you communicate with educators across the country. There are many parents. students, teachers and administrators that want to hear what you have to say, but you need to start speaking the language of Social Media if you want your message to be heard. Please feel free to comment below with your thoughts on the use of Social Media by the Department of Education. Well articulated argument. The ability to engage in open and ongoing discussion about important issues has never been so needed nor so possible as it is right now. I only hope a well-placed individual at the dept of ed reads this and pays attention to what you have presented. I agree that they are not very good but I wouldn't compare them to Lady Gaga, Ashton Kutcher, kittens, etc. as that speaks more to the inane interests of the consumers than it does to the creators. With due respect, when @EdPressSec goes on Twitter, and starts dropping links to articles not just lauding RttT but pointing to attack pieces by others against those who dare question policy, he's step beyond passing out press releases. Since there is NO one at Ed.gov to engage with, he's it. The reality, they don't want to engage. You write as though they could get more teachers on board if they were just better at communicating. They are excellent at communicating their vision, and their plan. They are horrible at convincing most education thought leaders who are actually working with students because we know their policy is junk with little research behind it. They put up a page of "research" about their plans, and most of it was from a couple of hacks at the Gates Foundation and the studies were largely non-peer reviewed. It's like saying, well the problem with Hoover's policy to address the Great Depression was that he just wasn't as good at the PR as FDR. Well, that may be true, but the policies were also completely inadequate for the job. Ok, so #edchat and a lot of the content-specific twitter chats are fast-moving and may be hard to moderate if someone such as Secretary Duncan were to magically appear. The ISTE conference, on the other hand, would've been a great place for him to show up and meet some of the biggest movers and shakers in the education world. My point is that the Dept is bad at more than social media - they're bad at socializing period! All roads once led TO Rome... which made Rome the most important place in the world because all of the knowledge and wealth were flowing INTO the city and influencing the government. Unfortunately in the US all of our roads always seem to lead FROM Washington. Their policies are easily able to get out, but trying to get information or perception to go the other direction is impossible.